Wayfarin' Stranger...you absolutely made my day. Thank you ever so much for your comment on yesterday's post. I'll bet you heard that snappy bite I took out of the beauty, all the way from here! Yum! This is the BEST time of year for so many reasons. 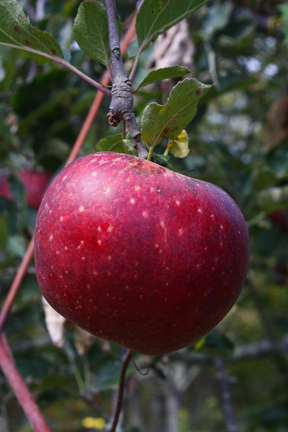 One of my top ones is the luxury of practically an endless supply of crisp, sweet apples! Today MM and I picked another of our trees clean and wound up with four five-gallon buckets! It's always nifty to climb the ladder and survey the world from above; inventorying the abandoned bird nests, and poking through the limbs is such fun! Trying to push the fruit picker through the gaps in foliage, and scrabbling to catch the beauties before they hit the ground is always challenging. 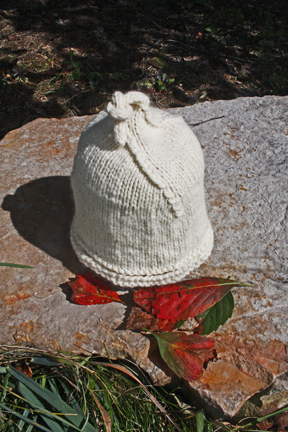 And, now, with frost in the air (Sunday) and maybe a snowflake or two...it's time for woodfires in the cookstove and soup on the back eye. And, of course, Apple Crisp for dessert. 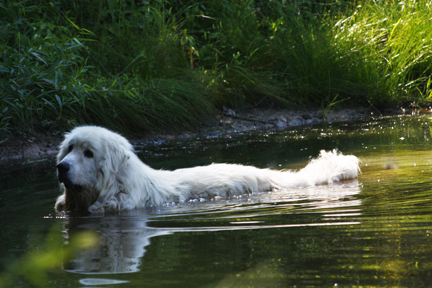 Thanks all for putting up with my rant yesterday about the Great Pyrenees. Barbara, Blogger is still trying to fix something that won't let me post comments on my own blog. Again. So, thanks for the suggestion regarding contacting breeders directly. It's a good one. It's the way I always purchased my Border Collies and we always had top dogs. I'll keep your ideas in mind. So, all...have a wonderful weekend. Football, popcorn, apples, wool sox and good company. How can you beat it?! Remember Torre? Our Great Pyrenees? The one upon which a huge old maple tree fell…and felled him, as well. Through no fault of his or ours (other than the fact that he wasn’t supposed to be inside the yard, where he was when the old widow-maker came down) we were left without our big white friend. 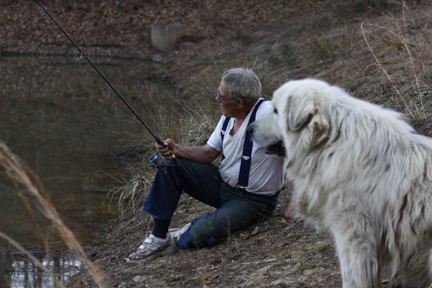 This morning a dear sweet friend rang me early –knowing that we were still looking for a GP—to tell me that she had been at a gathering last evening during which she overheard several people speaking about a Great Pyrenees that had been “dropped” by the road at one woman’s house. Alas, having fallen in love with the dog, she and her husband ultimately decided it was too large to keep and their situation was such that the dog would be in danger, being close to the road. They contacted the Appalachian Great Pyrenees Rescue, hereinafter going by acronym, AGPR. At this time, this morning, my friend wasn’t sure just what was transpiring, but it seems that some three weeks have elapsed since the arrival of the dog and real time now: it also seems (and I am only going by heresay) that not one, but now four GP’s had shown up, having been subsequently dropped at the same locale. The people who could not keep the dog made a Herculean effort to contact local shelters, and ultimately the AGPR to try to find a place for the dog, now dogS. We live five miles from the woman’s home. Of course, nobody except my friend who lives 25 miles in the opposite direction, knew that we were looking for a GP. Her call sent me to the vet who had custody, now, of all four. I mean, folks…. It isn’t as if there are a hundred people on the streets of Richmond, Virginia who can open their back yard to a Great Pyrenees; and who will pay a boarding bill of unknown amount, and a vet bill also of unknown amount, for a procedure we would not have wanted; beg for an interview to have an unknown personage come to inspect our premises to determine whether or not we qualify to own a stray Great Pyrenees (who knows what afflictions and diseases it has), and then drive all the way to Richmond to pick up such a dog, made even more ridiculous since the dog was only five miles away when this whole fiasco came about. It turns out that the dogs are still here. But the “transport” is already in the works and cannot be aborted. How does that strike you? I am devoting my blog today to giving the Appalachian Great Pyrenees Rescue organization all the publicity they so richly deserve. We dealt with this same organization a year ago, and the same barriers started to go up almost immediately during the phone conversation. We were again expected to drive to Richmond, Virginia, accept a dog sight unseen, pay any residual vet fees, and drive back to West Virginia. And again, we came up empty on a Great Pyrenees. Protecting a dog is one thing, but logic and common sense should govern. And arrogance has no place in this type of operation. Obviously that’s not the case with this “rescuing” agency. Needless to say, there will be no Great Pyrenees in the foreseeable future of MM and Elora out here JOTOLR if we have to go through this hostile organization. Here's an answer to your wonderful comment, Barbara. Blogger won't let me comment...so we'll go around 'em! 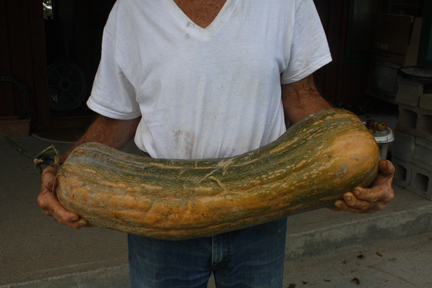 This is a butternut. 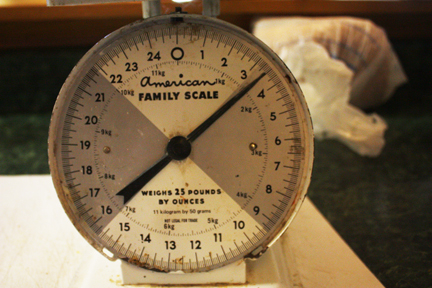 Weighs 24 pounds...and we have a few more. As I mentioned yesterday on the blog, Native Americans counted on the Three Sisters as staples for their diet: squash, corn (or maize), and beans. So do MM and Elora. If we had to, we could survive nicely on only these three to provide a balanced diet of carbohydrate, protein and vegetable fats and sugars. All three grow very willingly; domestic animals eat the leaves and stocks; in cooking, all can be flavored in a variety of ways, adding natural herbs such as sage and wild onion and wild garlic; they are nutritious and it's hard to ruin them in the cooking process. Too bad most people these days have no idea how to prepare them. Count the ways they can be eaten: Corn can be ground for tortillas, johnny cakes, fritters; kernels can be soaked and added to soups and stews; or cured for hominy to make grits; beans are soaked and cooked in twice the volume of water as the volume of the beans, then set on a back burner to cook for several hours. For faster cooking, I use the pressure cooker, but a wood stove is ideal for slow-cooking a pot of beans...add onions, (and if you are flush consider adding a little bacon, too) and you have most of a meal; add squash which offers a sweet-tasting vegetable that can't be beat. If you don't want it as a vegetable, make a "pumpkin" pie for dessert. 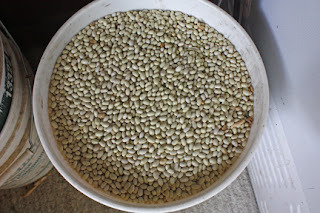 Here's the Third Sister: 35 pounds of dried beans grown this past summer and winnowed three days ago in the brisk wind we often get in the fall. 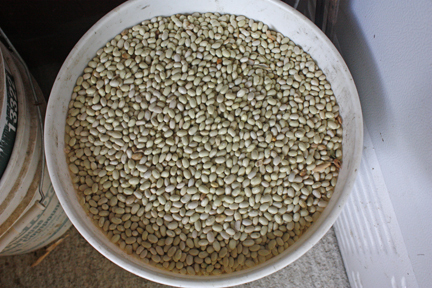 The gusts blow away the chaffe, and leave the heavier beans behind, clean and ready for the pot. Cost for a Three-Sisters meal? Hmmmmmm. Caculator handy? Pennies, even with amortizing the cost of growing. Most expensive part is the energy cost of preparation unless you have access to a woodstove or even solar. We used to call this Indian Corn when I was in elementary school. 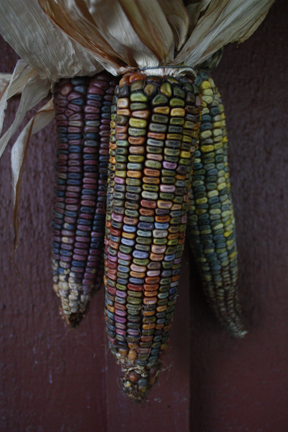 If you had an ear of Indian Corn, or even just a few kernels, you had something really special. (probably because growing it requires a longer growing season --longer, that is, than that in the Pacific Northwest, so it was rare to bring it to harvest). I always loved the colors, but never thought of eating it, much less grinding it for cornmeal. But, this is akin to the native corns of Mexico, part of the "three sisters" group that sustained life in South American cultures for over 7,000 years: beans, squash, and corn--grown together to take advantage of the symbiotic relationships these plants have with one another, and provide protein, and carbohydrates and vitamins in the right proportions to eat well. Did I miss something here??? And, we're letting Monsanto get away with this. Remember? Corporations are people, now. 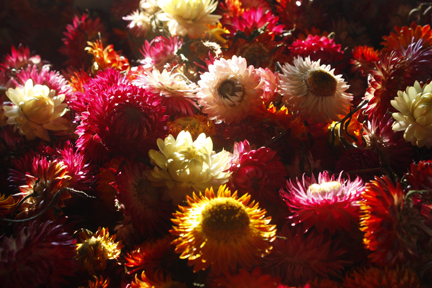 These are called Strawflowers. Indeed, they feel like straw, and to my senses, have no fragrance I can detect. But the bees love them. So do the bees come to them for the color or is there hidden magic humans don't recognize? 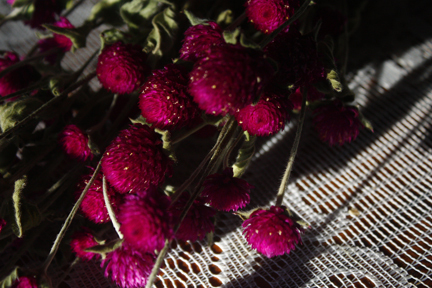 I also grew a few of these...called Gomphrena. I was first attracted to them when we visited Monticello. Late in the fall, the everlastings graced many of the brick walkways throughout the grounds of Thomas Jefferson's home. The humble little flowers give so much by way of rewards for having cared for them during these past months of scorching summer. A little water in the face of that fierce sun, and a little love and they return in great measure as we take them with us into winter. No water is needed now. I have a white square bowl into which I gather the blooms, and frequently run my hands through the profusion of splashy-dashy colors with pure pleasure. 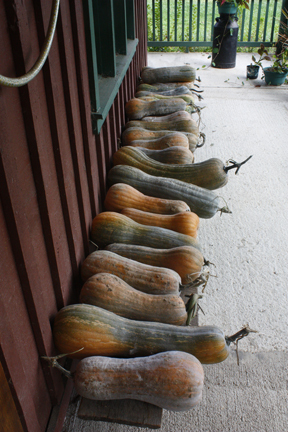 They need to be harvested before they open completely in order for them to retain their shape and vibrance. Simply let the stems dry. Light wires can be added to replicate the stem if you have a dried arrangement that requires one. 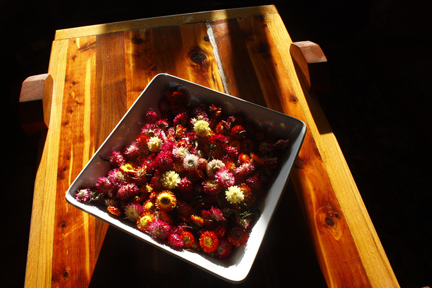 I simply keep adding the harvested blooms to my bowl that sits on the coffee table that MM made. 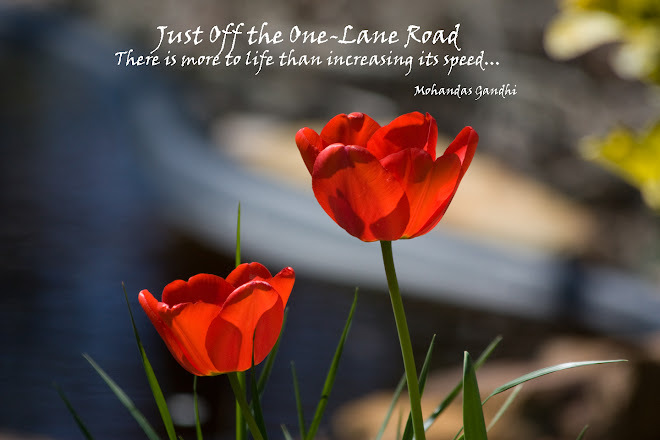 What a joy for so little care! Yesterday, we made a haul. On the notion that the itty-bitty rain we got a couple of days ago, might have sparked a puffball flush, we took to the fields, eyes down instead of up....and made out like a couple of bandits. 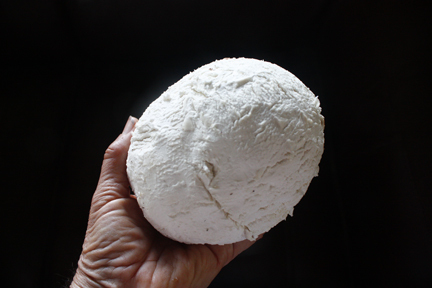 This is only one of TEN puffballs, two about this size, the rest half that size or slightly bigger. Puffballs are amazing. They range in size from smaller than a marble, to larger than a basketball. They grow from low altitudes to over 9,000 feet, in dry soil, wet soil, and both in hotter temperatures and cooler ones. When the flesh is still firm, they have a great and succulent flavor, they can be found in most states, and according to a spokesman for the US Forest Service, all species known, found in the US, are edible (though they shouldn't be over ripe). Better still, when prepared, they don't shrink as much as the more commonly available button mushrooms, found in stores. These mushrooms are not only one of the most recognizable mushrooms and one of the most wide spread, they also often have a long growing season, as long as conditions are right. 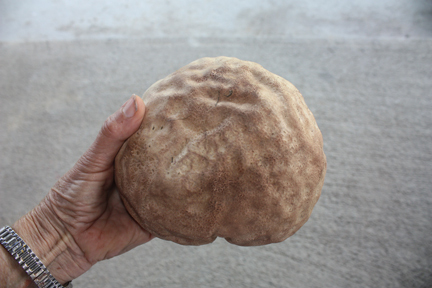 Smaller ones are harder to find, but giant puffballs are hard to miss. I have a few "haunts" where puffballs seem to return every year. They "flush" just after a good rain. Once home, I tend to them immediately. No waiting around, because they are ripening fast and minutes count. THEY DO NOT STORE so don't plan on using them later. They must be cooked and frozen right away. 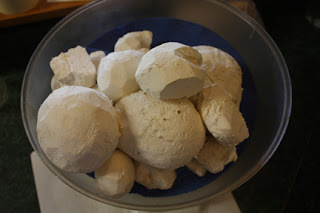 So, first step is to brush off all dirt and grass using a soft-bristled brush and then peel the puffball completely, cutting off the anchor end with all the dirt on it. Brushing the puffball clean is definitely to be preferred over washing. What is meant by this is the the outside AND inside should be pure white, no brown, not creamy yellow. And not "wet." 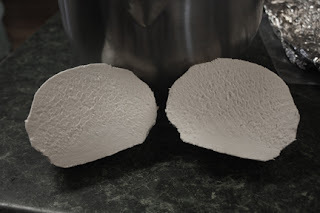 If, when you cut the puffball open, you find a colored interior, put those puffballs back out in the field and let spores form from them to produce more puffballs. The inside should be pure white-white. Wow! What a reward for foraging! 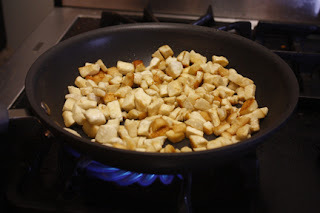 And finally to the fire...saute in butter. Brown lightly, then cool them, and freeze in small packets ready to top anything that needs mushrooms. These are much sweeter than mushrooms. Bottom Line: gourmet eating for free out here JOTOLR! Remember: all puffballs are edible so long as you keep only the ones with a pure white interior. So, you're safe. Remember, too: I covered this last year at this time, and I'm still here! 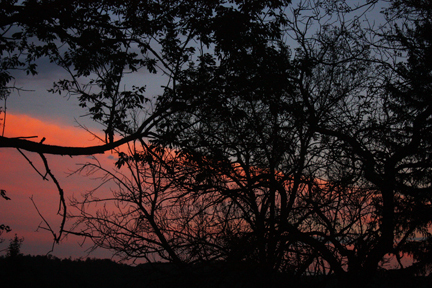 I stepped out on the porch after dark last night. 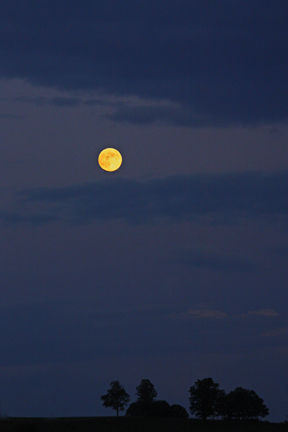 We are a favored area for skywatchers inasmuch as we are far from city skyglow. The Big Dipper, Orion, in fact all the notable constellations are visible in all their splendor here JOTOLR. 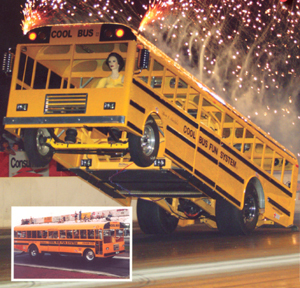 But as I stood and watched, I began thinking what it would be like to be looking up at the sky and without warning, have a six-ton flaming school bus appear out of the night, zeroing in on our mostly finished garden. Somehow it seems a bit cavalier that NASA proclaims it's number one priority to be ...ahem..."safety." (cough,cough) And what would they be willing to do should the rogue space capsule descend directly onto my house? Or smash the garage? Or make beef BBQ out of Marigold? It would seem that some revised opinions of the "limitless" and "vast" universe are in order here...Frankly, it seems to me we've gone from vast to crowded in three or four decades. And, don't you think we need some kind of astonomical janitor service? Here's a graphic that shows the current distribution of all the space junk (and we're not just talking wrenches, here...) that's flying around up there. Overhead, as it were. This is SIZABLE junk. A six-TON school bus, to name just one object in that necklace of dots, that more resembles fur. 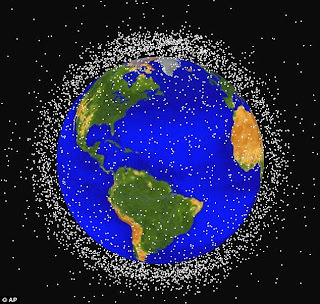 In fact there was an article the other day I read someplace on the Internet, which was an admission that the amount of space junk was now a serious hazard. It's a worrisome topic with those planning future assaults on the upper atmostphere and above. Personally, I know that if I'm outside on a clear night, not very many minutes go by without my being able to pick out many moving objects. Of course, I am not talking about airplanes (which also, BTW, are in much greater numbers in the night sky what with private corporate jets, military, commercial and helicopters). I'm talking about those itty-bitty moving lights waaaaaaaay up there. That's what the above graphic shows. If each one of those weighs at least even a ton, we are in deeeeeeep do-do. Thank you, those of you who have been wondering about my non-existent posts lately...we've been clearing up the last of the garden, making spaghetti and pizza sauce, and a couple of things: I signed up to take, not one, but five, online knitting courses; plus, MM and I have begun to put forth some effort in our proposal to organize and launch a community association. It's a good bit of work, but over time, we believe it will be successful and valuable. As of this moment, having contacted several neighbors, we have almost universal support. That is a gratifying start to what we anticipate will be an extended process. 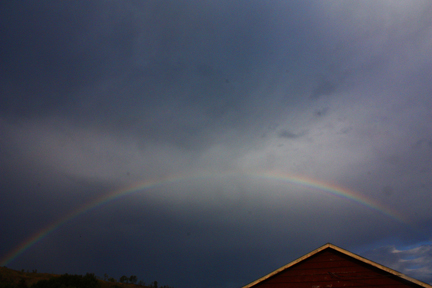 Here are a few pix taken in the last couple of days.. It's going to be a chilly weekend out here JOTOLR. 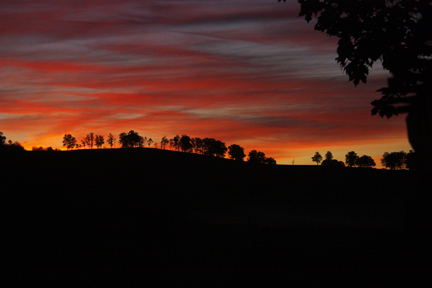 Wishing you a peaceful and restful couple of days! Football season is on! Yea! Mom always taught me that if I couldn't find anything nice to say about something, then don't say anything at all. I have nothing nice to say about these critters and their near-relatives this time of year. They are positively...waspish. Short-tempers, combative, threatening flight patterns directed at our heads and sneaky chemical warfare dealt out with absolutely no tolerance or mercy. "Get a grip," I holler. And by golly they do! MM and I are victims of their nasty personalities of late summer. They hover over anything that might have the least bit of sugar and buzz past at frightening speeds and proximity to our noses. I stemmed grapes inside to be on the safe side. Nonetheless, when I went out to harvest the last of the Catawbas, sure enough, I got stung. I was ambushed. The sneaky devil was right inside the cluster. Popped out and visited me with guerilla warfare. Finger swelled up and itched like mad! MM was mowing. Minding his own business. 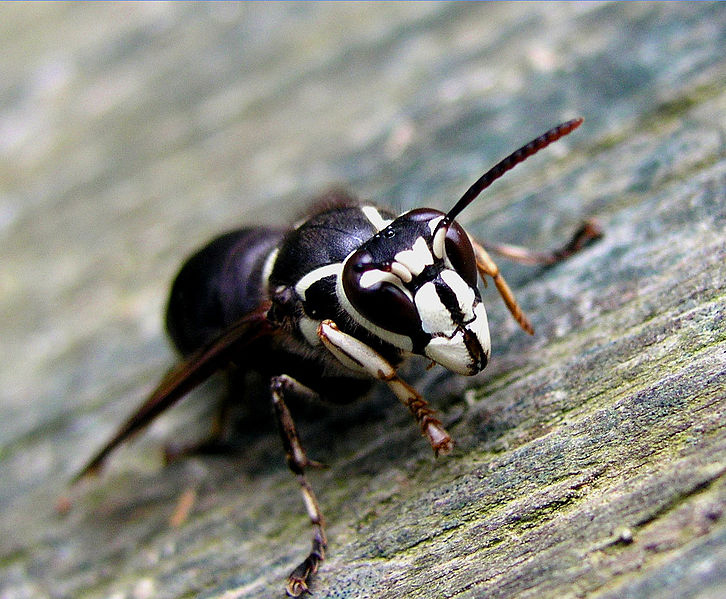 And encountered a particularly virulent personality, resulting in his getting stung...several times. One just flew through the office a few minutes ago. We are getting very wary. I know over winter we will find the huge nests of what some affectionately call "baldy." They are enormous and almost seem to be hiding in plain sight. I hate using sprays and I am not unaware of the "good" these guys do in terms of attacking and eating pests. But I am not a pest. Not in my own garden and vineyard. There needs to be some understanding, here. For the moment, I carry a pocket swatter at all times!